Share this list with a friend! Now more than ever, the calls to support Black-Owned businesses are critical and necessary. You know why - I don't even need to say it. I'll be the first to admit - it took me a smooth 5 years to set foot into my first Lush store. I just didn't "get it". Lush is no stranger to LA - we've got at least 3 stores (that I can think of) within a reasonable distance. But shortly after the Del Amo location opened, I decided that I had to at least go in and see what all the fuss was about. From a visual and aesthetics perspective - I get the appeal. The colors are pretty. The black packaging is minimal and cool. The natural ingredients, plus the nifty lil' sticker telling you who made your product by hand is also a nice personable selling point that makes the purchasing experience a little more intimate. When I wear my 9 to 5 hat, I get the appeal of Lush. I really do. And I'm not knocking Lush - or anyone who loves them - by any means. I gave Lush one lassssst try, because Samuel actually took a strong liking to their Kalamazoo Beard & Face Wash. I purchased The Sacred Truth and Brazened Honey masks - and to be honest, I liked them well enough. If anything, I felt like those might be the two things I purchased from Lush again - if I ever went back. But then I started doing what I love to do - analyzing ingredients, thinking, researching, and being critical of how and where I spend my money. And smack dab in the middle of an empties video - ranting about Veganese - it hit me. Christina, you know there are Black-owned companies out there doing this. Companies that use fresh ingredients, craft by hand, and lean on nature for solutions in the pursuit of healthy skin. You. Know. This. (Imagine the clapping emoji hands between each word). And from that random rant back in September, a post was born. 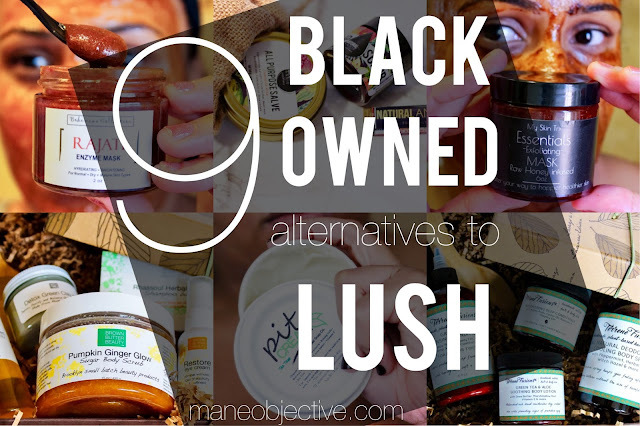 I scoured the internet and social media for Black owned body and skincare care brands, cultivating a list of 15+ businesses that fit the mold (aka what about Lush appeals to people). From there, I pared down and reached out to the owners of the brands because instead of just creating a random list for clicks and shares, I wanted to be able to tell a little bit of their story - a little bit of what makes them special. These brands are the ones that ultimately, I fell in love with. And I hope you fall in love with them too. All Things O'Natural is deeply rooted in healthy, green living. In fact, the Bohemian Collection is the skin and body care offshoot of the Natty Naturals brand. 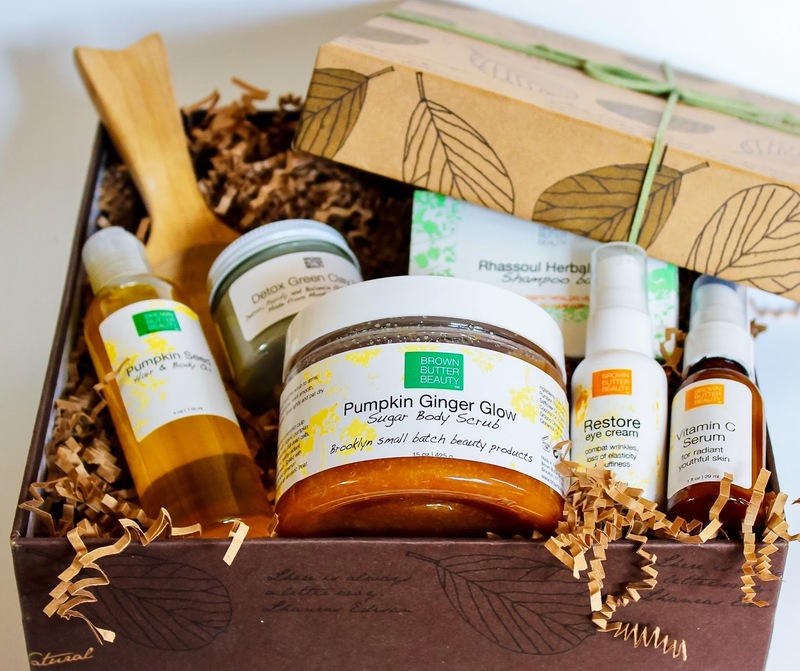 With holistic living at the center of the All Things O'Natural brand, founder Dominique sources the the most powerful plant-based ingredients to produce small-batch, handcrafted products that compliment mind, body, and spirit. Running over with anti-aging, skin-healing goodness. Let. Me. Tell. You. About. These. Masks. (again with the emoji clapping hands). If you follow me on Snapchat, then you how I get down for #FaceMaskFriday. I've intentionally kept mum about the brands I used, because I wanted it to be a huge surprise. 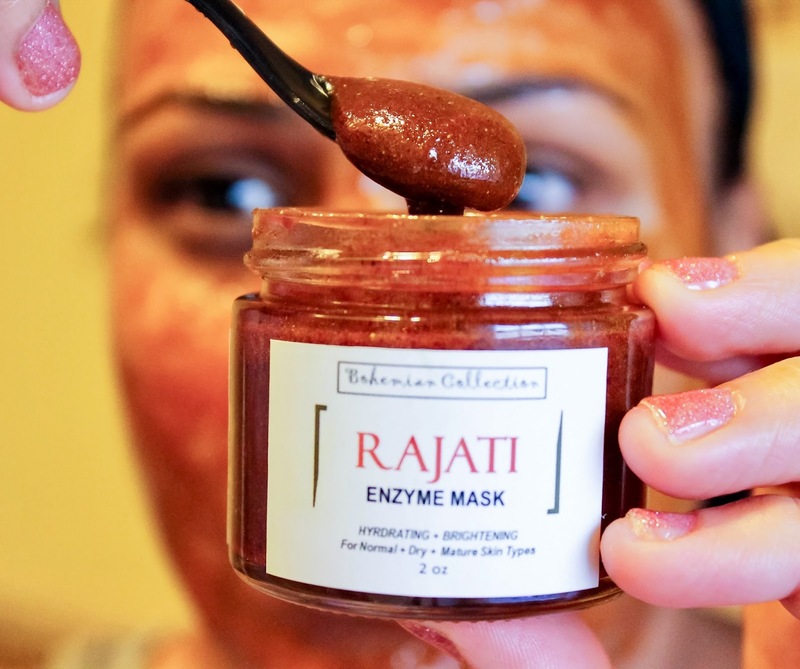 The Bohemian Collection Rajati and Kijani Enzyme Masks are the TRUTH. 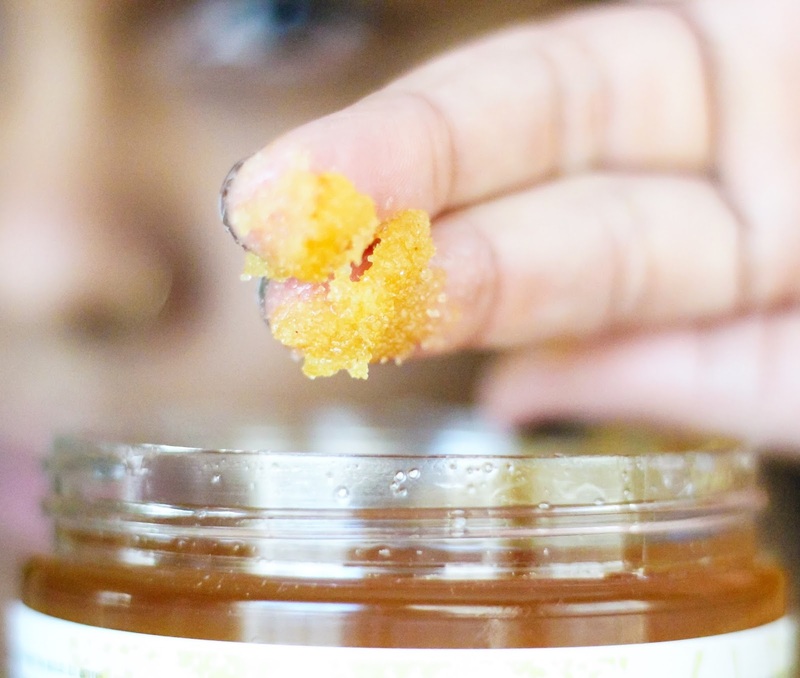 Both are in a thick base of raw and Manuka honey - but that's where the similarities end. The Rajati mask is packed with certified organic strawberry, hibiscus, ashwagandha, amla, haritaki, and bibihitaki - all of which contribute to producing a natural glow, fighting the signs of aging and UV damage in the skin, repairing skin damage, anti-inflammatory properties, and stimulating collagen production. In short, if you're on a mission to make sure that no weapon formed against your #BlackDontCrack shall prosper, Rajati Enzyme Mask is the one! Kijani on the other hand, is overflowing with certified organic matcha, banana, pumkin, gotu kola, brahmi and more - making it an incredibly potent free-radical and UV damage fighter, acne-causing bacteria eliminator, and skin repairer for conditions like eczema and psoriasis. If you suffer from breakouts, or skin conditions like eczema or psoriasis, Kijani is definitely worth checking out. And if it's a hot oil treatment you're after - definitely check out their Hair + Scalp Treatment which is a heaven-sent blend of certified organic oils like safflower, coconut, avocado, and neem blended with stimulating therapeutic essential oils like anise, cedarwood, cinnamon, bergamot, and peppermint to soothe itchy scalp, stimulate growth, and add intense softness and shine to hair. Found these babies at my local Vitamin Shoppe! 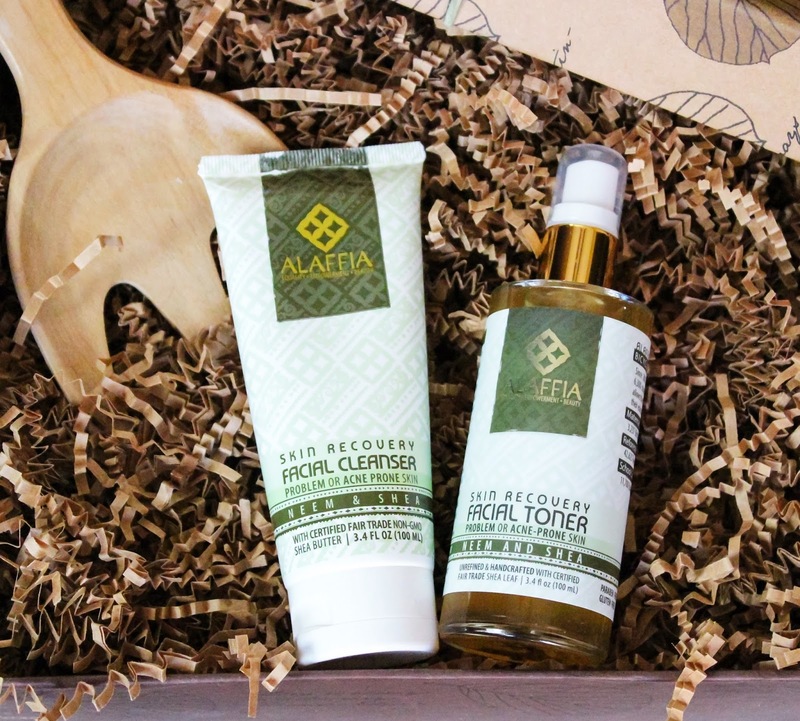 Alaffia is a certified fair trade body, hair, and skin care brand founded by Olowo-n'djo Tchala with the sole mission of alleviating poverty in West Africa. The shea butter used in Alaffia's skin, body, and hair preparations is handcrafted in Togo at Alaffia's Shea Butter Cooperative. Employees of the cooperative are paid fair wages, receive healthcare and benefits. Proceeds from the sale of Alaffia products helps fund their maternal care clinic, reforestation (#sustainability), and school supplies for youth in West Africa. For me, Alaffia is a shining example of what it looks like when indigenous populations share their natural resources and are not taken advantage of. Alaffia products are a staple in my household and have been for some time. Samuel and I are both huge fans of the Authentic African Black Soap (we have the 32oz bottle on deck at all times). I'm also a lover of their Neem & Shea Skin Recovery Facial Cleanser and Facial Toner. Both are packed with neem extract, neem oil, shea butter, and tea tree - which helps soothe and treat skin conditions like acne, eczema, and psoriasis. I couldn't do this list without Bekura Beauty. I COULD NOT. Bekura Beauty is rooted in self-care. What originally began for Rashida as a DIY hobby became official in 2011 with the launch of the Cacao Bark Deep Conditioning Hair Mask. The spa luxury/apothecary vibe that Bekura Beauty gives off is not by accident - each product is designed to encourage us to slow down and indulge in self-care, while moisturizing and rejuvenating dry skin and hair. 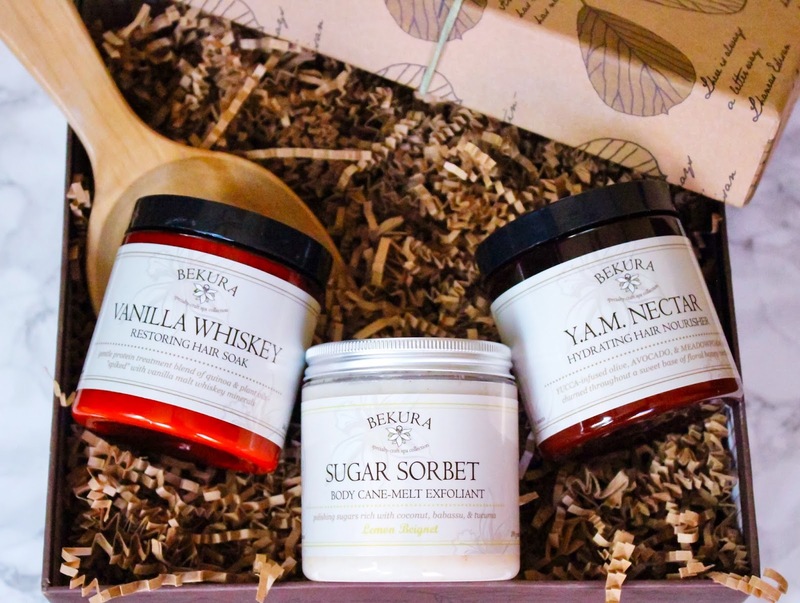 Bekura Beauty products are unique in that they're created with fresh, epicurean-grade botanicals that smell good enough to eat (trust me, I've been tempted on more than one occasion). Just a spoonful of heaven. I haaaaaaad to throw one hair-related brand in for good measure. Is it really any coincidence that my picks happen to be the best sellers here? And remember what I said about wanting to eat the products? I dare you to tell me that Y.A.M. Nectar doesn't look delicious, or that the Lemon Beignet Sugar Sorbet Body Exfoliant doesn't smell EXACTLY like a beignet drizzled with lemon. Plus for me - the hallmark of an amazing body scrub is one that leaves the oils behind - even after towel drying - so much so that you don't need lotion. And that's precisely what the Lemon Beignet does. All three products are a God-send and heavenly treat that I highly recommend if you're looking to reduce stress and turn wash day into a delectable spa day. You can read more about my love for Bekura Beauty here. Quite literally a spa day in a box. www.brownbutterbeauty.com & select stores and Amazon! Christine's mission with Brown Butter Beauty is simply, to make women feel beautiful and confident - inspiring excellence. In her own life, Christine learned that while pursuing a successful career, time for self care and balance are incredibly important. 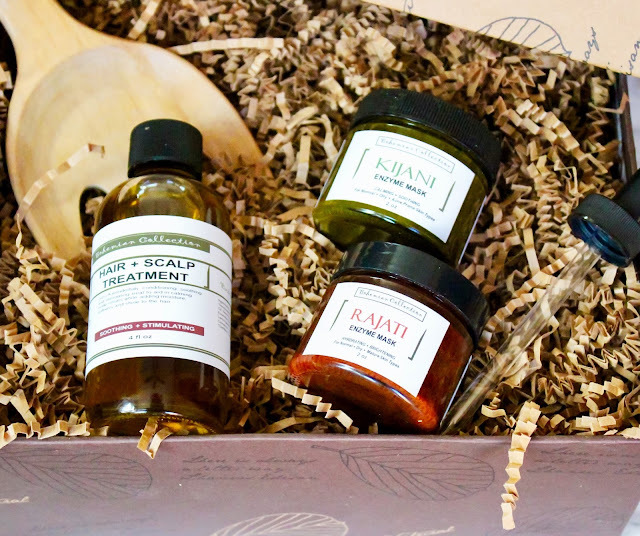 Out of a desire to live a healthy, balanced life, Brown Butter Beauty was born as a one-stop shop for luxury skincare products for women and men! Yes for the fellas one time! Pumpkin on pumpkin on pumpkin. I'm addicted. Ummm...everything. 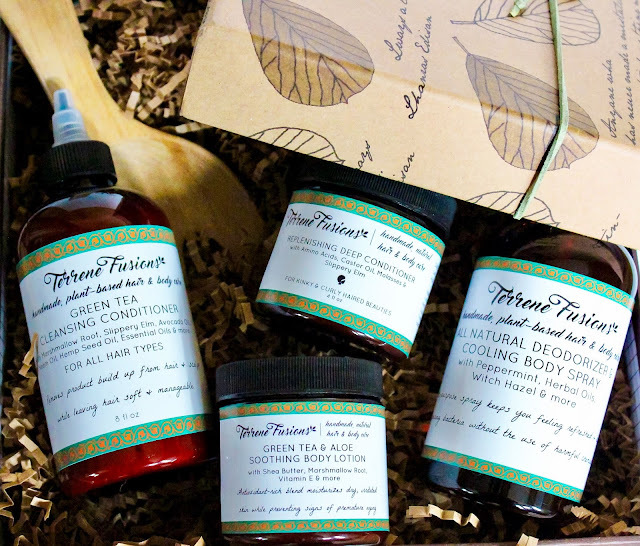 But seriously, Brown Butter Beauty has so many amazing products that I've tried and fallen in love with. I'm a longtime fan of the Rhassoul Herbal Tea Shampoo bar, and nothing has changed. 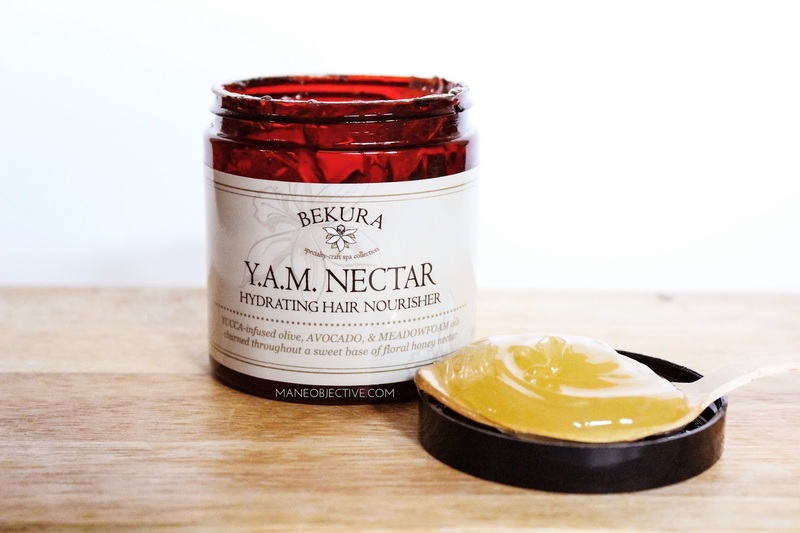 It has amazing slip, soothes and cleanses my scalp, and makes my curls pop! I've also been obsessed with this idea of #foreveryoung skincare, and let me tell you how amazingly clutch Brown Butter Beauty's Vitamin C Serum and Restore Eye Cream are to my life. I've been on the hunt to find these two types of products in particular - but without all the synthetic ingredients and fillers that would do my skin more harm than good. And let me just tell you, I hit the jackpot! If you're looking to maintain youthful, radiant skin and reduce eye puffiness and dark circles, look no further. Brown Butter Beauty has you handled. On mamas. Oh and I absolutely cannot neglect to mention my newest addiction, Pumpkin Ginger Glow Sugar Body Scrub. It's pretty much everything I love about this season in a jar. Made with pumpkin powder, pumpkin pulp, and pumpkin oil, it's an anti-aging powerhouse and addicting face and body scrub that feels as intoxicating as it smells. Like pumpkin pie and pumpkin spice latte, without the guilt (or shady ingredients). Kyra's Shea Medley's holds a special place in my heart. The brand is Black Bruin (#UCLA) born and bred. It all started for Kyra as a college student on a budget, experiencing difficulty in finding quality, effective, and natural hair and skin products. 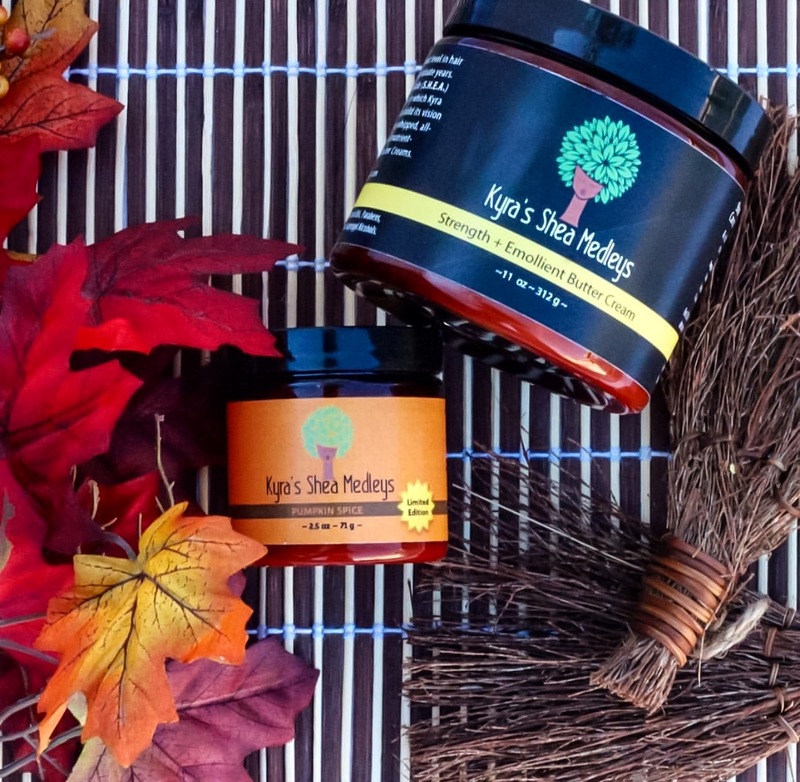 Instead of investing more time in seeking out products, or driving far distances to get what she needed, Kyra turned inward for a solution and began creating her own unique blends of butters and oils to cater to the needs of her hair and skin. Kyra's Shea Medleys has gone on to be on Good Morning America's Shark Tank Your Life with Daymon John, and be featured as one of Mashable's 11 Black-Owned Businesses Changing the World. Through the KSM Gives Back one-for-one program, Kyra has been able to donate over 2,9000 butter creams to local nonprofits, homeless shelters, and clinics - all chosen by her customers. Listen. KSM Butter Creams are that JAM. Over the course of the years, I've used KSM products on everything from my edges to elbows. From healing burns to styling buns. Hands down, my favorites are the Original, Strength+Emollient, and Growth+Restore Butter Creams. Original smells like God's blessings over my life - and I use it from head to toe. Strength+Emollient is bursting with juicy mango, and makes an excellent all-over body nourisher, burn healer, twisting butter, and end sealant. Growth+Restore is bae for edges (if they're thinning or fragile) and smells like minty chocolate. My Skin Trx scrubs remind me of bath bombs. Super cute! Jasmine launched My Skin Trx because quite simply, she was unhappy and uncomfortable in her own skin. On a mission to discover her own natural beauty and glow, she developed the My Skin Trx line focus on effective ingredients, powered by nature. She believes that everyone deserves to have access to happy, healthy skin and non-toxic, plant-based skincare products. My skin is about to be poppin'. Just watch! My Skin Trx is magical. 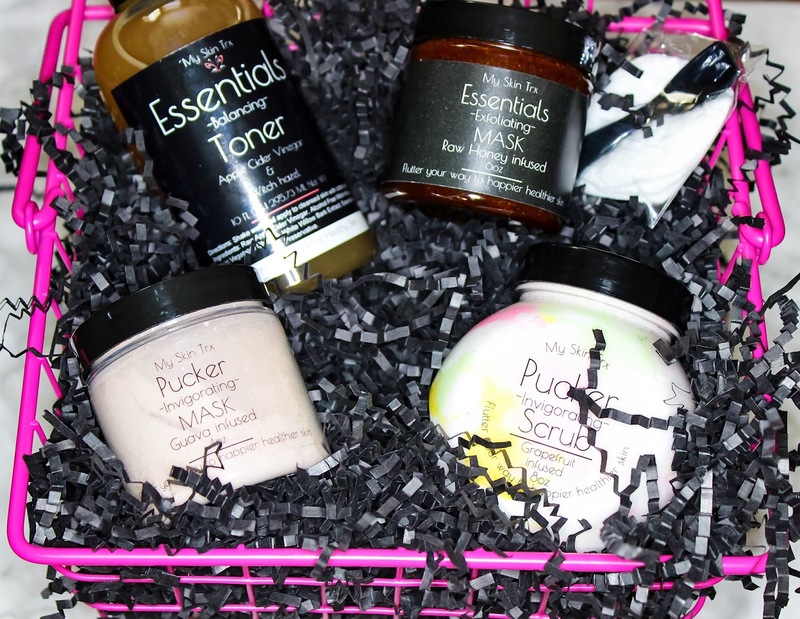 I absolutely love and adore the sticky, gooey greatness of the Essentials Mask. 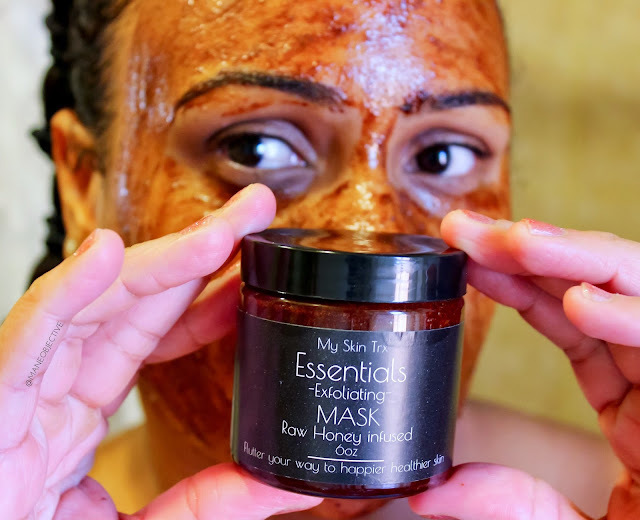 Packed with raw honey, cinnamon nutmeg, lemon juice and turmeric, this mask is perfect for brightening, tightening, toning, pore-refining, acne-fighting, and exfoliating the skin. I'm also a huge fan of the Pucker Invigatorating Mask. It's a dry clay-based mask, and you can whip up as little or as much as you need with water, witch hazel, apple cider vinegar, aloe vera juice, and more. I love mixing it with the Essentials Balancing Toner to enhance the detoxifying and skin-clearing power of the mask. My Skin Trx also changed the game with scrubs - instead of an oil-based moisturizing exfoliant, their scrubs are whipped-soap based, which makes them excellent 2-in-1 body cleansers and exfoliants! I love to leave my grapefruit-infused Pucker scrub by the sink, as a nice hand scrub since I get callouses from weight lifting. Self care from head to toe, without the toxins. Natasha's first child was born in 2006, with a severe case of cradle cap. After an apprehensive and ineffective encounter with medicated dandruff shampoo, Natasha began researching alternative methods for treading cradle cap that didn't involve harsh chemical ingredients. After curing her son's cradle cap with Extra Virgin Olive Oil, Natasha was led to dive deeper into the world of natural skincare and green beauty. Naked Bar Soap Co. prides itself on using only natural ingredients to bring out the best of what nature has to offer. There are no questionable or unrecognizable ingredients in Naked Bar products, and Natasha stands 100% behind the true definition of 'naked' for her brand - undisguised, and devoid of concealment. First things first. Pit Cream is bae. I've been looking for a non-toxic alternative to commercial deodorants for a while now, and none of them quite cut the mustard. Tom's couldn't keep up with my lifestyle. I thought Nubian Heritage might work, but turns out Samuel hated the smell. I tried a few others here and there (like that Crystal deodorant stick made of salt), but none of them were the 'one'. Until I met Pit Cream. It's the only natural deodorant to keep me from being a hot, stinky mess about the pits. I HIGHLY recommend it. 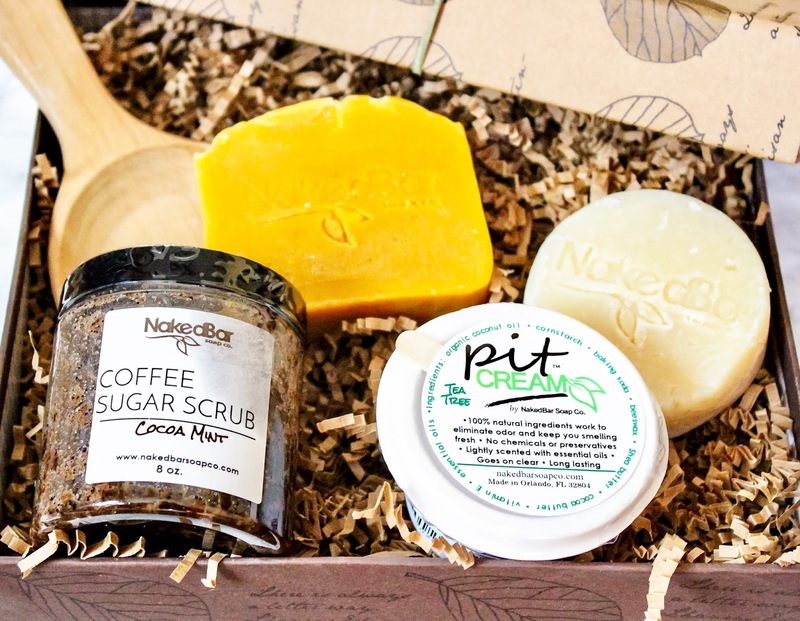 I'm also a huge fan of the invigorating Cocoa Mint Coffee Sugar Scrub (I mean come on, it's coffee heaven), and the Neem Shampoo bar is also amazing (it has beer in it!). But as you guys know, I'm in full pumpkin swing so by default, my absolute favoritest is the Pumpkin handmade soap bar, with orange, cloves, cinnamon, and pumpkin added. It's been in my shower since it landed at my doorstep. It smells amazing, cleans my skin without it feeling dry, and because it's all natural, is psoriasis-friendly. Softness and suppleness abounds with this trio! About two years ago, Annya's daughter underwent multiple surgeries, which took a toll on her skin. When over the counter creams proved ineffective, Annya took matters into her own hands and turned to nature for solutions. After only a week of using homemade oil and herbal based concoctions, her daughter's skin began to improve. That sparked Annya's desire to create, so she began making products for her family and friends who encouraged her to go all out. Piece by piece, NaturalAnnie Essentials took off. 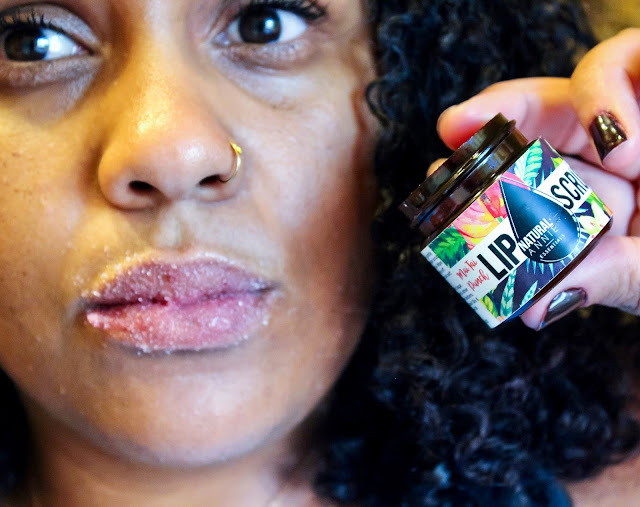 The lip scrub that gives LIFE! First things first. I'm a sucker for cute branding, and NaturalAnnie's branding is EVERYTHING! The gold, the pops of color - it just speaks to my inner "shiny things and bright colors" being. Okay, I had to get that off my chest. 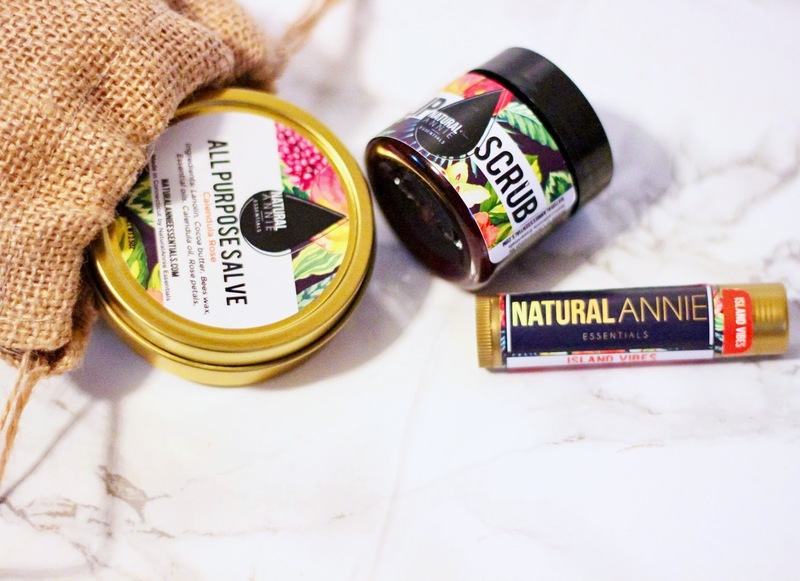 My favorites seriously are the Lip Scrub, Lip Balm, and All Purpose Salve. The Mai Tai Punch Lip Scrub gives me unholy cravings for an actual Mai Tai or rum punch (and I don't even drink like that). It smells edible (drinkable? ), and leaves my lips soft and invigorated. Topped off with the Island Vibes Lip Balm (which I'm very tempted to taste because it smells like the most ah-MAY-zing tropical punck), my lips are poppin'. And the All Purpose Salve? It's Calendula Rose, and packed with cocoa butter, calendula oil, rose petals, and an invigorating blend of essential oils. I use it to soften those darn callouses on my hands (I'm telling you, lifting weights is a gift and a curse lol), and nourish my cuticles and nail beds. I'm also trying it out as a soothing balm for my psoriasis - and so far, so good! Terrene Fusions is truly something special. After transitioning to natural hair in 2009, Michelley was dissatisfied with the available products on the market for textured hair. Her story is one many of us share - filled with cocktailing and modifying store-bought products just to make them palatable and semi-effective for textured hair. An avid label reader, Michelley began learning about the ingredients in many haircare products, and grew alarmed with the number of toxins present inside those bottles and jars. Knowing that our skin absorbs toxins, Michelley set out to create her own hair and skin preparations, inspired by nature. After perfecting her recipes across several years, she began sharing her plant-based recipes under the banner of Terrene Fusions. 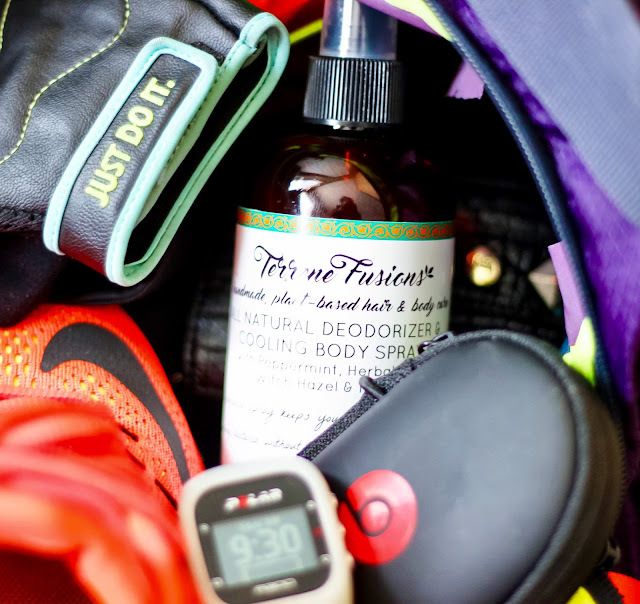 Terrene Fusions' spray is a gym bag MUST HAVE. I can describe the Green Tea Cleansing Conditioner, Replenishing Deep Conditioner, Green Tea & Aloe Soothing Body Lotion, and the All Natural Deodorizer & Cooling Body Spray in one word - ADDICTING. The Green Tea Cleansing Conditioner is amazing - it has slip, moisturizes and detangles, and gently cleanses. I love the nozzle tip (points for thoughtfulness! ), and the fragrance is addicting - somewhere between green tea and that cherry almond fragrance I've loved all my life. The Replenishing Deep Conditioner is definitely one to watch - it's packed with 16 different amino acids and protein - all while having crazy slip and moisturizing the hair. Y'all know how I feel about proteins and aminos for the hair - it's an obsession. Not to mention, it smells of heavenly sweet cinnamon spice. The Green Tea & Aloe Body Lotion is head to toe super moisturizing, and you already know what green tea can do for the skin! The most random, but equally as lovable product for me is the All Natural Deodorizer & Cooling Body Spray. My Snapchat fam has seen me post about it before, on several occasions. My love for this spray is REAL. It's a bright infusion of witch hazel, lemongrass, lavender, tea tree, peppermint, and eucalyptus and is a must-have if you lead an active lifestyle. It's a great under arm refresher, body refresher and cooling spray for post gym, and you can even use it to spray inside of your gym bag and shoes. I keep it in my bag at all times. Michelley is so dope that she wanted to partner up for a giveaway! Stay tuned because tomorrow on my Instagram Stories I'll be doing a quick demo and review of the Green Tea Cleansing Conditioner, Replenishing Deep Conditioner, Green Tea & Aloe Soothing Body Lotion, and All Natural Deodorizer & Cooling Spray. After that, you'll be able to go to my Instagram post and enter to win ALL 4 of my faves from Terrene Fusions for yourself! Stay tuned! Those are my 9 picks as an alternative to Lush. I've managed to successfully integrate them into my everyday body and skincare regimens, and I couldn't be happier. Will you be giving any of them a try? Let me know in the comments below - and don't forget to share this article with your friends and family! The holiday season is the perfect time to support Black owned brands! Also - if you know of any other Black owned body and skincare brands, drop them in the comments below! OMG I want to order everything. My skin is so sensitive. Thank you for sharing now I need to see what to order first. I love love love your blog! When I saw the words "Lush Cosmetics", you know I was drawn in as I've used their henna since going natural, and I love it. I don't care for their other cosmetics for some reason...and I'm not sure why. BUT I DO love experimenting with other natural body care products, and being black-owned is a definite plus! Have you heard of Butters N Bars? I usually get my raw shea and mango butters from her. Please check them out as well! Thanks lady! One more thing if I may: can you make this article into a PDF? If you have an iPhone you make this page into a pdf. I would recommended Anita Grant products. Christina, as always, a post chock full of goodies. Thanks for such a thorough and informative list of brands, some of which I had never heard of. I'm in trouble come Black Friday/Cyber Monday. In the past year I've gotten hooked on the delicious smelling soaps and mists from Jaden Moon. They're handmade and wonderful. All Things O'Natural has moved to the website www.nattynaturals.com. This is really attractive for me. The products specially the Lip scrub give me impressive results specially in winters. I used to apply honey on dry lips but not now. Affordable and magnificent. Thank you. This is a great article! I would love to have FabYouLife skin & hair care included in the next article. Very interesting and amazing article. These products are affordable and great to use and give good results. Thanks aton. I loved the face mask. Would like to use in my daily beauty routine. However, I also uses eye cream to get rid off dark circles. This is amazing. I loved it. Definitely I'll try these for my skin. From few days I'm having dark circles on my face. I hope this will help to me. I love and work for LUSH. They are a great company. I also love trying new things. There is enough love for everyone if their products work. Try the Ro's Argan in Shower Body Conditioner from LUSH and pick up a Charity Pot lotion. The lotion supports over 403 grass roots charities that are either local, domestic and overseas. If you have any suggestions for vegan natural bath bombs, I would love to support a black owned company! Skin around the eyes need proper care can provide long term benefits. Changes to the skin around the eyes, also known as the periocular area, can have functional, cosmetic and psychological ramifications. I love this. I've been looking for recommended black owned products. Thanks for the info.